The motel was built in and around the trees, and it is nice to sit outside and relax. There is a gazebo/ pagoda patio area with tables next to a rock water feature. Out back are athletic fields if you want to watch a local game. There is designated free parking for one regular-sized vehicle, with overflow space in the front of the hotel. In consideration of other guests, the hotel is Non-Smoking and Pets are Not Allowed on the grounds or in the rooms. There are several designated smoking areas. In our new vending room in the north building we offer Guest Coin-Op Laundry - one washing machine 1.50 per load and one dryer 1.00 per load, soap and dryer sheets sold at 1.00 each. We also have snacks and soda, as well as Complementary Ice. Here you can also pick up area information and attractions leaflets. The hotel offers Wake-Up Calls. We also have irons and boards that can be sent to your room. Note that the office is open 6AM-10:00PM (22:00) hours. Guests can check-in after hours after making arrangements with the hotel. There is always someone on-site or nearby to assist in case of emergencies. New Salt Water Pool Now Open. We are excited that our new outdoor pool is finally ready to be enjoyed. We invested in a salt pool for the health of our guests. The water is not salty; we use salt instead of chlorine to keep the pool clean. Pool hours are 9am to 9pm daily. Pool towels are available. The pool depth is 3 feet to 5 feet, 38 feet long by 18 feet wide. It's an outside unheated pool - traditional Maine style. All rooms have a/c and baseboard heat, microwaves and mini-fridges with freezers, hairdryers, extra blankets and sheets, chest of drawers, activity table with two chairs, black-out blinds, private baths, 3-dial shower heads with shower light, and bath amenities. Cribs are available upon request. Ever wonder about the air quality at hotels that are in a box with no access to outside air? Ever wake up at hotels and feel dried out with a stuffed nose? 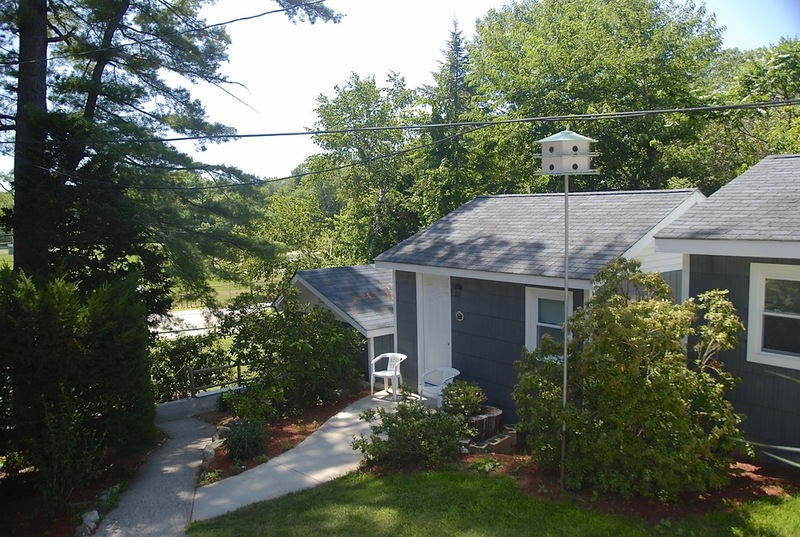 The rooms at Kittery Inn and Suites have multiple access to fresh air, with new Powerful Bathroom Fans vented directly to the outside, new Windows That Open up with screens, and room doors that open directly to Patios or Decks. Let in the fresh Maine air and get a good night’s sleep. We took into consideration when renovating the motel about how to make guests feel comfortable and secure. So now every guest room has new RFID Electronic Key Locks with dead bolts, Door Viewer Peep Holes to see who’s knocking, and Night Latches for extra peace of mind. The in-room guest phones can dial the front desk or 911 Directly if there is an emergency. The hotel has a safe at the front desk for guests to leave small valuables, 24-hour recorded Security Cameras on property, and a manager who is on-site 24/7, which is actually not common at many of the chain hotels. Waking up ready to go is not a problem at the Kittery Inn and Suites. Our Large Alarm Clocks are easy to set, automatically adjust to daylight savings time, have multiple sounds like Ocean Waves or Babbling Brook, and have an Audio Input MP3 cord to plug in your phone or pad so you can even enjoy your own music. The hotel also offers in-room Wake-Up Calls – just let the front desk know and we will ring you then. If you need to be connected, other hotels in the area would be hard-pressed to match Kittery Inn & Suites’ online connection experience. For one, we have Both Wired and Wireless in-room internet access. Our WIFI network is the same quality system used at the Winter Olympics. We regulate bandwidth usage so every guests has plenty to watch movies, work and play on multiple devices. Both networks have added systems in place that are very secure for guest Privacy. And, we offer Extra Bandwidth for more devices at an additional per night fee. Our new bedding package includes multiple pillows and linens laundered crisp with premium-grade Ecolab Detergents, including our duvets and Duvet Covers that are cleaned for every guest. The beds are new 800-Coil Count with quilted panels and foam padding for a firm yet comfortable feel. Guests ask us how to buy the beds. Tuck yourself into a good night sleep. All guest rooms have large Hi-Definition Flat Screen HD TVs with close to 200 Cable Channels, including ESPN and CNN. We also offer 6 Free Movie Channels. Our custom-designed in-room Channel Menu has all your favorite channels at your fingertips. 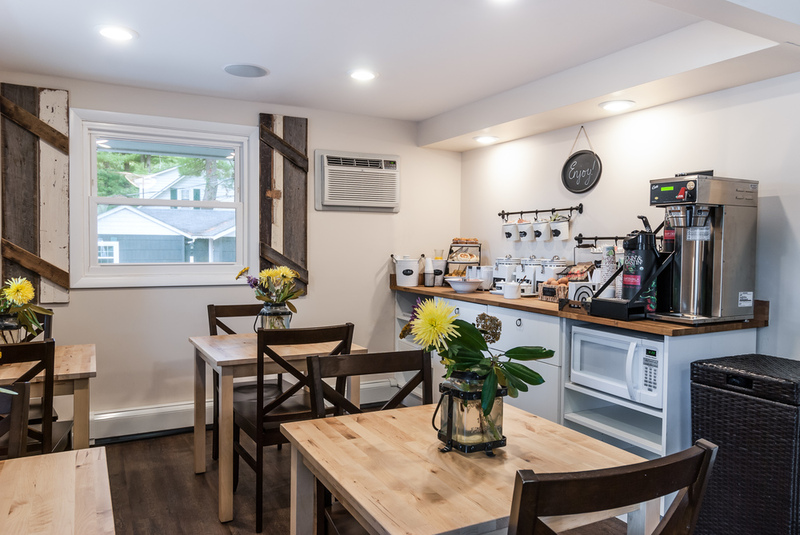 Not only for your convenience, but for your pleasure, the Kittery Inn & Suites has new coffee brewers with premium in-room decaf and regular coffee, as well as both herbal and black teas.